Computer literacy is of vital importance nowadays, and that importance is only going to grow in the coming years. Knowing your way around an Excel spreadsheet won't be enough for the next generation. Having a basic grasp on programming will likely be essential when today's children enter the workforce -- and at the 2016 Worldwide Developer's Conference (WWDC), Apple announced the impending launch of an iPad app that will help ready today's kids for tomorrow's future: Swift Playgrounds. What are Apple's Swift Playgrounds? Focused entirely on Apple's own Swift programming language, Swift Playgrounds present children with a series of challenges to solve while teaching them the basic coding skills needed to solve them. During the WWDC presentation, one example featured a character walking around the outside edges of a square. The code provided had the character move to the end of a side and turn, but move no further. The solution was that the code needed to be repeated for each side of the square, guiding the character back to the start. Teaching fundamental concepts like this teaches more than just language; it teaches the kind of logic that will be applicable regardless of what programming tools a student may pick up in the future. And by providing a visual environment that exists side-by-side with the Swift Playgrounds' coding challenges, kids can see the results of their efforts in real time, giving them a better understanding of what to do next. Swift Playgrounds isn't the only option on the market when it comes to offering kids the opportunity to code, of course. On iOS, a variety of options have been available -- from Hopscotch to the Sphero SPRK robotic ball. And moving away from the world of mobile, MIT Media Lab's Scratch has been teaching kids on the web the basics of programming since 2005. Outside of programming, there are a range of options meant to gently introduce kids to game design too, from the physical bricks of Bloxels to the familiar faces of Adventure Time Game Wizard. 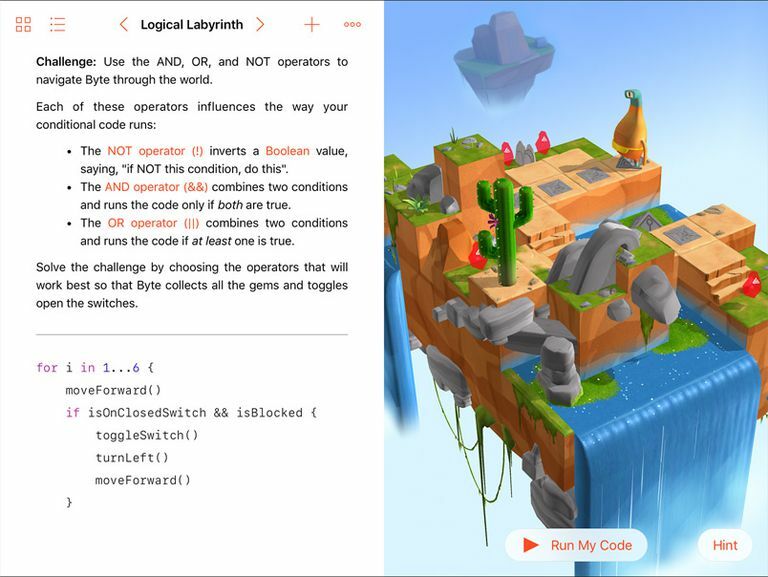 What sets Swift Playgrounds apart from most of its competitors, of course, is its unwavering commitment to Apple's flagship programming language. Since its introduction at WWDC 2014, Swift has seen widespread adoption amongst iOS game developers. As of this writing, it is the 14th most popular programming language in the world according to the Tiobe Index. Having a generation of kids who know it inside and out? I suppose that's not the worst vision of the future from where Apple is sitting. Being created by Apple gives Swift Playgrounds a few advantages, too. For example, they've developed a keyboard tailored to the unique programming needs of Swift, offering an autocomplete that suggests the next bits of code you might need. Swift Playgrounds will also scale alongside a user's growing skillset, progressing from the building blocks of programming in Swift to more advanced challenges and concepts. "Swift Playgrounds requires no coding knowledge, so it’s perfect for students just starting out," reads Apple's official Swift Playgrounds website. "It also provides a unique way for seasoned developers to quickly bring ideas to life. And because it’s built to take full advantage of iPad, it’s a first-of-its-kind learning experience." Of course, being kid-friendly doesn't mean it's just for kids. Interested iPad users of any age should find Swift Playgrounds to be a helpful introduction to the world of programming. The fundamentals course alone promises to teach the following core development concepts: commands, functions, loops, parameters, conditional code, variables, operators, types, initialization and bug fixing.